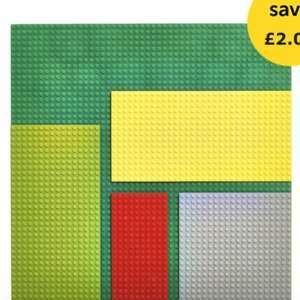 The Blox base plate 5 pack provides a great starting point to bring all your Blox creations to life! The 5 pack includes base plates with the following sizes: 40 x 40cm, 25.5 x 12.5cm, 25.5 x 12.5cm, 16 x 16cm and 16 x 8cm. Thanks OP I had a look at the other Blox sets on the site, a lot cheaper than Lego lots of variety and seem to be just as good, its even compatible with Lego. Well worth buying. Bought previously and works well with 'real' lego, not too loose and the bricks stay on well. The large green panels would be great to cover a tabletop etc if 'hacking' a piece of furniture. Totally, these are a great addition and so cheap compared to real Lego. Also worth buying is the drawstring Lego bag \ mat thing. Can swish up all the loose Lego in seconds keeping the bedrooms clean. I have to say, my 5 year old getting into Lego is the best thing to ever happen to me!